The Provincial Government had peaceful protesters arrested on Monday for having a tipi in Wascana Park. The government’s position was that the grass would be harmed, and the tipi would be a distraction from the Canada Day festivities, and probably for the National Aboriginal Day festivities in three days too. 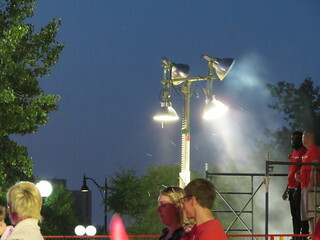 As you can see, it’s quite distracting when a tipi is at a Canada Day party. 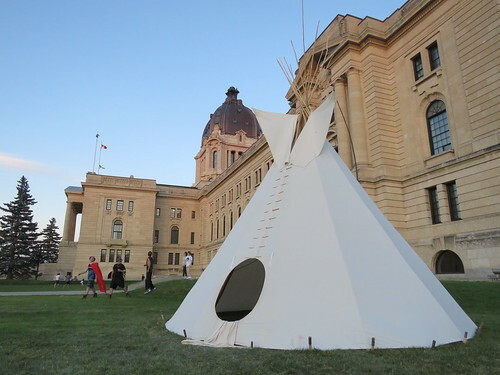 Or perhaps they didn’t want it to upstage the tipi set up even closer to the Legislature last Canada Day? After requiring them to dismantle the ceremonial camp tipi set up to protest @SKGov's ongoing removal of Indigenous children from their families, @reginapolice @evanjbray are now holding 6 people in custody. This is satire but it does talk about what a lot of people are saying about what happened to the Justice For Our Stolen Children Camp. This entry was posted in Uncategorized and tagged Canada, First Nations, holiday, news, politics. Bookmark the permalink. Who made the decision to arrest them? PCC or Regina Police. Police have since backed off.